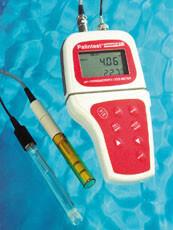 Palintest, of Erlanger, Ky., has introduced an easy-to-use meter that can measure pH, conductivity, temperature and total dissolved solids (TDS) in all aqueous solutions. The Waterproof 800 meter is suitable for use in the field, and its high specification makes it equally suitable for laboratory use, research and specialist applications. Economical in comparison to purchasing separate instruments, the meter has many features that are easily accessible through the large, water-resistant membrane keypad.